Dr Shane R Higgins is a fertility specialist with a family-orientated practice. 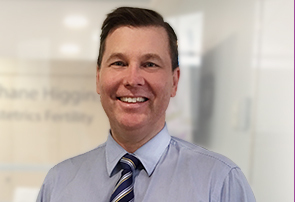 Dr Higgins specialises in reproductive endocrinology and can offer complete services of caring for you from initial fertility investigations right through to pregnancy and delivery. Click on the below mentioned tabs to know more about his services. If you wish to be advised on the most appropriate treatment, please call the (07) 3015 3140 to schedule an appointment or click to request an appointment online.